For a number of years I lived in Playa Del Rey, just north of LAX and I worked in Calabasas, just east of the Ventura County line. This involved a rather long and arduous commute up Pacific Coast Highway (usually with the top down, unless it was raining) followed by a quick right turn up Malibu Canyon road (unless it was raining, in which case all bets were off). A terrible thing, this drive along the beach twice a day. 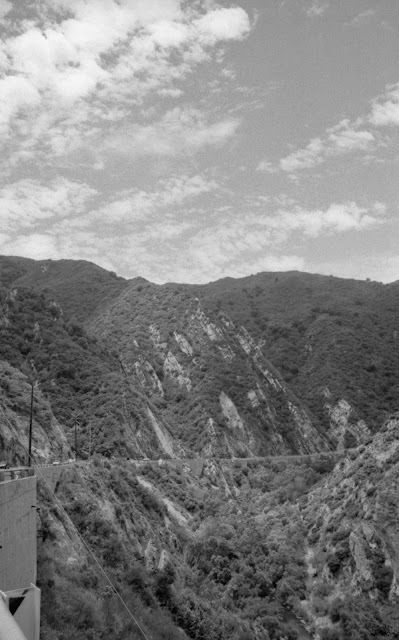 I still drive down Malibu Canyon from time to time, since it is about 1/2 mile from my office. I'll drive down to the ocean and take photos and get lunch at Malibu Seafood, a really good but not particularly inexpensive seafood place just on the east side of PCH. Get me my dose of sea air. Having just driven my niece Jamie through this canyon, I've recently become aware that this is a particularly Californian landscape. This particular view is from the northbound side of Malibu Canyon road looking north. There are a number of pullouts along that side; I stopped at one and took a few frames. I had just got a new Nikon Series E 28mm f2.8 lens and was eager to try to capture this view. I'd tried some months ago with my Pentax 6x7, but as I noted a few posts back, I don't have a wide angle, so this view was quite truncated, with barely any sky visible, and none of the water running down the bottom of the canyon. 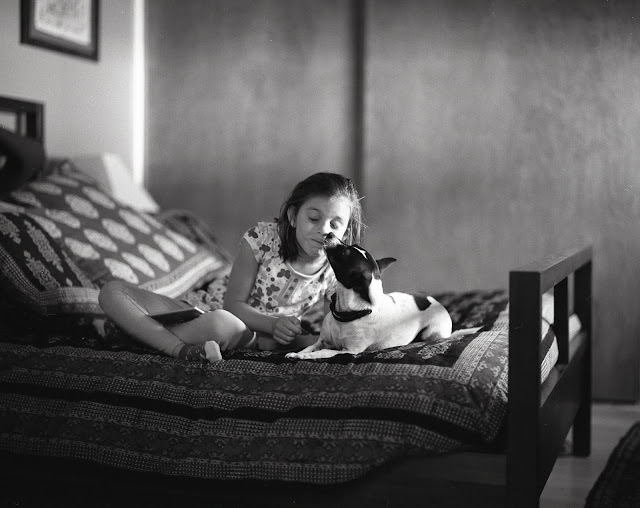 I had an orange filter on it and a roll of Arista Premium 100 speed film loaded up in one of my Nikon F3s. In an effort to get some significant depth of field in order to hopefully get the clouds, the stream at the bottom and the road along the west edge all in focus I stopped it down to 22 and set the camera atop the guard rail and took about a two second exposure. I'm pleased with the way it came out. That is a sharp little lens, that Series E, and the distortion is certainly acceptable. As an aside for you camera fans... The Series E lenses were released by Nikon along with their budget EM camera in 1979. 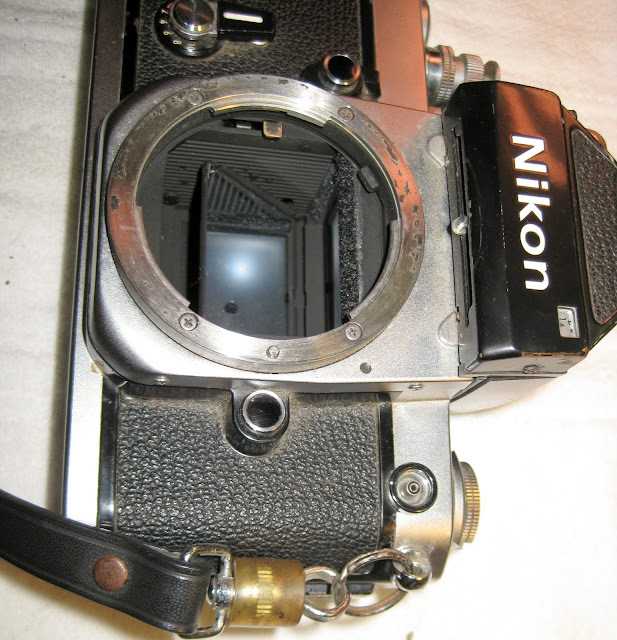 The EM was an aperture priority only manual focus camera body that was quite a bit smaller and lighter than the other Nikon offerings of the time. It also eschewed the typical precision build quality and durable materials of the Nikon professional cameras, like the F2 and F3. The Series E lenses were an attempt to create a less expensive lens line to go along with their new inexpensive camera, and they feature primarily "resin" (i.e. plastic) construction, albeit combined with top notch Nikon optics. While both the camera and lenses were considered marketing failures for Nikon, in recent years the lenses have gathered a certain cult following among photographers who realize that despite the plastic construction they are excellent little lenses. They are less flimsy than the modern all plastic autofocus lenses, that's a fact, and I have found the quality of the optics to be quite high. Any time I can haul around a bit less weight I'm happier for it, so I've put together a little traveling package with a 50mm f1.8, a 28mm f2.8 and a 100mm f2.8. Together the three lenses weigh less than my 50mm f1.4 Nikkor.